1. Rafa Nadal’s new and improved serve. The guy never served in the 130 mph’s before, and now he does. 2. The explanation for Rafa’s new serve: grip change. Not the gym, not practice. Nope. He changed his grip ‘a couple of days’ before the tournament. 3. The appearance of Rafa in the broadcasting booth at the beginning of the quarterfinal match between Djokovic and Monfils. I watch a lot of tennis, and never ever does a top player appear in the broadcast booth at the beginning of a match. Topic of discussion? Rafa’s new grip. He just happened to have a racket with him to demonstrate it. Item number 3 above had ‘control the message’ written all over it. The big question is back up at #1: How did Nadal develop a faster serve at this point in his tennis career? No other tennis player has achieved such a feat. Is Rafa on the juice? 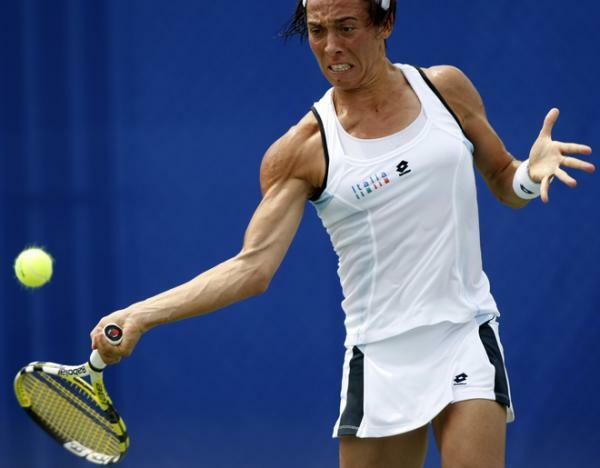 I googled ‘tennis steroid’ and found the web site ‘Tennis Has a Steroid Problem.” It’s an excellent site with gobs of interesting information and links to relevant material. In the first months of ‘04, 16 more players showed elevated test results for nandrolone, with the same analytic fingerprint as the previous positives and elevated negatives. According to the ATP, these players hailed from a dozen different countries, and their test results occurred at tournaments at different times in different parts of the world. Since there was no question now of contaminated ATP supplements, what explained these troubling elevated scores? No explanation has ever been forthcoming. Except for Ulirach and Rusedski, none of the other players who tested positive for performance enhancers or showed trace amounts in their systems has ever been identified. The ATP has refused to say whether these players were required to have follow-up tests. Tennis fans have no way of knowing whether the six unnamed players won tournaments, perhaps even Grand Slam titles, during the time when they tested positive. I’ve been a tennis fan for a long time, and I find it both sad and disgusting that the big business of tennis trumps fair play. Say it ain’t so, Joe! We all know about lots of ambitious pro-athletes who doped to get the gold and lied about it. They may have been “so stupid” or just “so ambitious.” They may also feel they “deserve” to juice because they practiced so much and their family sacrificed so much for their success. But then in September ‘80, Yannick Noah broke the silence in an interview with Rock & Folk, the French equivalent of Rolling Stone. While admitting that he smoked hashish, Noah accused other players of using cocaine. What’s more — and in his opinion what was worse — some were popping amphetamines. This infuriated him because it put clean players at a disadvantage. He lamented that they might have to use coke or amphetamines to stay competitive with drug abusers. He wanted the problem to be brought into the open and discussed. If it weren’t, Noah feared there would be deaths from overdoses. The reaction of tennis authorities and the press was to savage Noah for smoking hashish. His remarks about coke and speed were ignored, as were the players whom he said “take the hit during a tournament and crash afterward. You have guys who have played super during one tournament and who you’ve never seen again.” He mentioned Bjorn Borg and Victor Pecci by name. Here’s a New York Times article on doping from 2009. Bill Gifford questions tennis’ holier-than-thou image in this Slate article. Well, there it is. We went through this with baseball a few years ago. At this point, I watch baseball knowing that players are using PED’s. Now I’ll start doing the same with tennis. This entry was posted on 11 September, 2010 at 4:34 pm and is filed under Tennis. You can follow any responses to this entry through the RSS 2.0 feed. You can leave a response, or trackback from your own site. I’ve never been much interested in sports. Probably the way I was brought up, surrounded by academe. But it had nothing to do with corruption; I admired the players. Now I really don’t. It’s not about prowess or talent. Sad. Great articles. More and more people are questioning Nadal’s new “serve.” There’s so much more out there concerning him and doping, but the American public is just catching on to it now. You’re just dizzy from all those candles you lit for Fed. And maybe you’re jealous because with my winnings, I can finally buy that toaster I always wanted. If you had told me two weeks ago that I’d now be questioning some of the stuff I’ve seen in tennis during the past ten years, I wouldn’t have believed it. But here’s what I’ve learned: The ATP does not test for EPO or IGF-1. With regard to the testing the ATP actually does do, around 25% of out-of-competition testing does not happen on the first try (effectively giving the athlete a heads-up). To top that, some of the testing that is classified as ‘out of competition’ actually happens during competitions. Lack of testing for stuff that’s out there + sloppy testing = the distinct possibility that any player who wanted to could use performance enhancing drugs and get away with it. Or the uncle of a certain player. First, let me thank you for thinking enough of my thoughts to quote me here in your information-packed web post! Second, I read your post and much of the “steroids problem” site (thanks to other commentators who brought them to my attention) and agree that the ATP must be covering this stuff up. In Agassi’s book, he talks about how easily they accepted his excuse when he tested positive for a banned substance. Nadal and Federer are today’s Agassi and Sampras. Does anyone honestly believe that if Nadal tested positive, they would charge him and ban him from the sport for 2 years as others have been (Canas- reduced charge, Chela, Puerta). These players were third level in terms of audience draw, so no problem, let’s make an example of them. It’s vinyl window dressing to say that they have a no-tolerence policy, when in fact, they know that (a)almost no one tests positive because the users are years ahead of the testers, and (b)if a superstar tested positive, somehow, someway, it would be excused. Think about this: most athletes (Bonds, Clemens, McGwire) never actually tested positive, they were simply not believable and really were only convicted in the court of public opinion.